Pick up from home (or wherever you tell us) in Spain and delivery to Czech Republic within 4 days estimated. Shippings to Czech Republic up to 70% cheaper! No small print: final prices with all included (taxes, fuel surcharges, etc). Pay with credit or debit card using a secure and encrypted connection. Super easy: Once the payment is made, you will receive in your email the labels to print and stick on your boxes. The price of your shipment will be shown on the top part of your browser. Try to keep the shape of your boxes, otherwise measure them from the wider part. Provide all the required data to make sure the delivery can be performed, review carefully the addresses, emails, phone numbers, etc. I red first time about your service in Finnish Facebook forum Torrevieja. So this is my first time to use this service and so far everything has gone fine. Your support is flexible and and the whole procedure seems to work. They are very attentive and quickly solve any problem. When you have to make a move from one country to another ... when you see that things do not enter into bags ... and think the airport will clap for joy when they see all you'll have to pay to bring more kilos in the suitcase ...! How is appreciated Cangobox ever created! :-) All my stuff came from Madrid to Helsinki perfectly, from an address to another without having to go to the office of any shipping company to pick it up, and above all at the hour and day in which we had been! So now I can start relax making my suitcases, because I will always have a solution, and that is Cangobox! Thank you very much for your work! Keep that way !!! IMPORTANT! TNT calculates prices based on parcel measurements. Click here to understand better how to ship the maximum amount of kgs at the lowest cost. The maximum weight per parcel is 70 kg. Weight and dimensions of the boxes? The dimensions have direct effect on the price, please make sure they are correct. Atención: Suitcases and bags must also go in a box. If you have a discount code, introduce it in the field below. The discount code is invalid. The discount cannot be applied. Please, enter the contents of the parcel. We need to provide this information to the carrier. For example: books, clothing, maganizes. Separate the contents of each box using /. For example: books / clothing, maganizes / shoes would indicate books in box 1, clothing and maganizes in box 2, etc. What is the value of the contents? We need to provide this information to the carrier. This value will not affect the price of the delivery. This value does NOT mean cash on delivery. The declared value is requested by the carrier with statistical purposes. It is not an insured value. The insured value is defined by the obligatory insurance of the carrier, and it is calculated based on the weight of the shipment. If you are shipping new items, you can opt for an any risk insurance. Ok, I have reviewed the weights and dimensions of the boxes and I am ok with the price. What day and at what time do your want your delivery to be picked up from your address? Beware of possible holidays in your region: there is no pickup in such days. Attention! Please, review the information of pickup and delivery. Is everything included, right? Names, street, house number, floor, door, etc. When you have reviewed, it please click on the Go button to review shipment again. Very important! The phone numbers should be valid, and local at origin as well as at destination. If you provide a number that is not from the country, the carrier might return your shipment back to origin. The postal codes used to calculate the price are different from the postal codes used in the details of the shipment. Please make the appropriate corrections and try again. If you have any questions, please use the Help button at the bottom of the page to contact us. Unfortunately we cannot deliver from Czech Republic to Spain yet. You could use the Help button and send us a reminder so we hurry up even more. Thanks and sorry for any inconveniences. 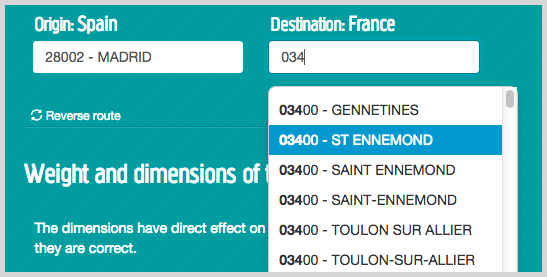 This operator calculates the prices based on the parcel dimensions. That is, its volumetric weight. Calculate the volumetric weight of your boxes to learn how much you can really put inside. When the real weight is higher, then the real weight is used. The shipping is insured. In case of shippings via land (the default mode), the coverage is defined by the CMR agreement and is equivalent to 5€ per kg. In case of air delivery, the Varsovia agreement will be applied, cobering 20€ per kg. The limit is the declared value of the contents of the shipment. Start by typing the first two letters of the city name or the numbers of the postal code. The available options will appear as you type. You must click on one of the options from the list. If the city or the postal code you need does not appear, please, contact us using the Help red button. If the city or the postal code you need does not appear please contact us using the Help red button. We have detected incorrect weight values. The minimum weight for this shipping is 2.0 kg. The maximum weight is 70.0 kg. One of more parcels weights less than 30 kilos but exceeds some of these dimensions: width 70 cm. x length 120 cm. x height 60 cm. In these cases the carrier applies an extra charge of 16.50 € per shipment. One of more parcels exceeds one of the next dimensions: width 120 cm. x length 240 cm. x height 180 cm. In these cases the carrier applies an extra charge of 36.30 € per shipment. You indicated that your shipment contains some parcel that is not stackable, hence it is not possible to place any other parcel on top of it. In there cases the carrier applies an extra charge of 36.60 € per shipment for International shipments, and 0.05 € per kilo, with a minimum of 5 € per shipment for National. You can continue with your shipment but keep these details in mind.